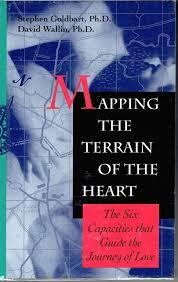 Terrain of the Heart Research Papers discuss a sample of an order placed for a reaction paper on counseling couples. I need a reaction paper, written in first person about the book, Mapping The Terrain Of The Heart (Passion,Tenderness,and the capacity of Love). This book is written by Stephen Goldbart, Ph.D, and David Wallin, Ph.D.
the six capacities discussed in the book by Goldbart and Wallin. Assess your defenses and how they are evident in your love relationships. For example, my personal defenses are anticipation, affiliation, humor, self assertion, self observation, and undoing. The paper should discuss which capacities are weaknesses , and which are streghths. How could your weaknesses or strenghths assist or impede your work in counseling couples or individuals who are struggling with intimacy. How has your family orgin shaped your capacities? This paper is based on the students ability to reconize the need for personal growth, and to illuminate his/her own life. This paper should be written from the perspective of a black female, mother of two girls ages twelve and nineteen.She was married at age seventeen, this was an abusive relationship which resulted in a horrific near death experience. She was divorced less than one year after marriage, the nineteen year is the product of the first marriage. She (mother) struggled for many years to overcome the impact of this relationship, it in part caused her to have a difficult time expressing love to her older daughter because the daughter bore such a striking resemblence to the abuser. The student has now been re married for thirteen years. She has a very difficult time maintaining her current relationship, because a part of her can never trust entirely. After her first divorce, she joined the army and served six years active and two inactive. She found it very difficult in the past,and still finds it difficult to feel worthy of anything more than nothing, because she has lost so much of herself in relationships. The subject's current marriage is nothing more than a show. Her husband does not communicate with her, he travels all the time and their priorities are completly different. She wants to love and be loved, and share a family life that her children will remember and tell their children about. He wants to make and bank as much money as possible and nothing else really seems to matter to him. The nineteen year-old daughter is very resentful to the mother because she feels that the mother abandoned her to join the Army, this has caused distance between this mother and daughter, though the mother has explained that she was trying make a better life for the daughter. The subject was reared in a dual parent home and was not lacking for material things as a child, whereas her current husband was reared in a single parent home , and was very needy as child. The subject is very attractive, and human beings are visual, and are therefore drawn to her, however she does not easily bond to others. Paper Masters writes custom research papers on Terrain of the Heart and discuss a sample of an order placed for a reaction paper on counseling couples.